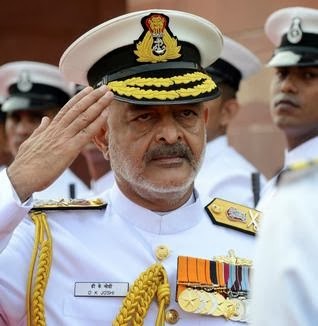 Indian Navy chief admiral DK Joshi resigned on Wednesday, hours after seven sailors suffered serious injuries and two officers remained "unaccounted for" in an accident on board India's Russian-built submarine, INS Sindhuratna. The latest accident 11th after the INS Sindhurakshak sank in August has put the navy's dismal safety record under further scrutiny and underlined its inability to maintain its dwindling Kilo-class fleet. Joshi's resignation has been accepted by the government. A defence ministry spokesperson said he had stepped down taking moral responsibility for the recent accidents. Admiral Joshi is the first military chief to resign. He took charge in 2012, had more than a year left in service. The Defence Ministry immediately accepted his resignation. Vice Admiral RK Dhowan will officiate till a new chief is appointed.The Russian-origin Kilo Class submarine, one of India's 14 conventional submarines, was carrying no weapons or ammunition. It had sailed out last night and since it was still being tested, had not been placed under operational command yet. Defence Minister AK Antony briefed President Pranab Mukherjee, who is also the Supreme Commander of the Armed Forces, and Prime Minister Manmohan Singh on the accident.